Fred Ouïd is cultivated “INDOOR”. It simply means that we guarantee the same Cannabis taste all year long in a pesticide free manner. The strains we have selected have a high CBD content keeping THC below 1%. Compare to other flowers cultivated in Greenhouses or Outdoor, you will note that our buds are more “rocky” as the plants remain shorter and all their “energy” goes into their flowers. Of course, these are much more expensive to grow but the partners we work with are all passionate individuals and our pricing reflects their great work (…and ours!) to offer the best product possible. Fred Ouïd N°5 has a “haze” taste: Spicy and strong. It comes from a V2 strain. Its buds are small are rocky with a very high CBD content (>25%). It provides more of a up-lifting feeling and blends very well with Fred Jaune tobacco. Indoor Cannabis is expensive to produce and state taxes make it expensive to buy! Our packaging reflect our commitment to offer you the quality it deserves as well as innovation you can expect from a brand like Fred. 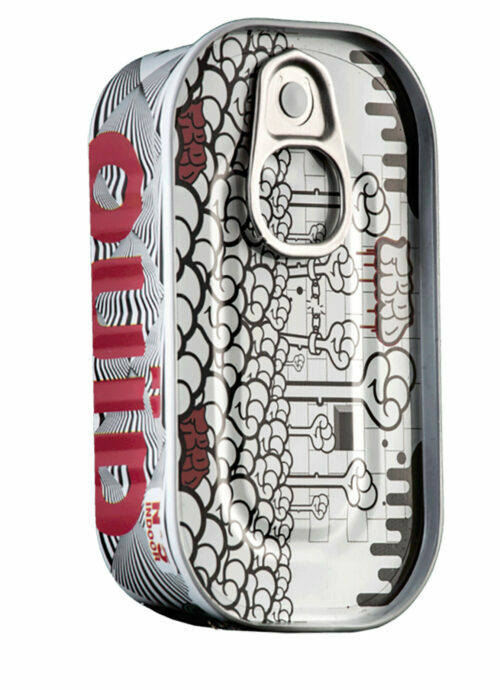 This aluminium sardine tin is produced in France and is 100% recyclable. Thanks to its specific humidity regulation system, it will preserve and even enhance all the flavours of the flowers over time. We use silicone for the closure lid (instead of standard plastic) as it is the only material on which Cannabis does not stick. Stay tuned as many other CBD products are about to come and will surprise you.